Every Tuesday evening I head over to Twitter to join the @CraftBlogClub weekly twitter chat. Craft Blog Club is a place for anyone who is crafty, not just those who run a craft blog or have a craft business. Using the hashtag #CraftBlogClub the host Kay introduces a range of discussion topics that we all jump in on. These chats can be based on anything, from our latest craft blog posts, current crafty projects or how to wrap awkward presents! 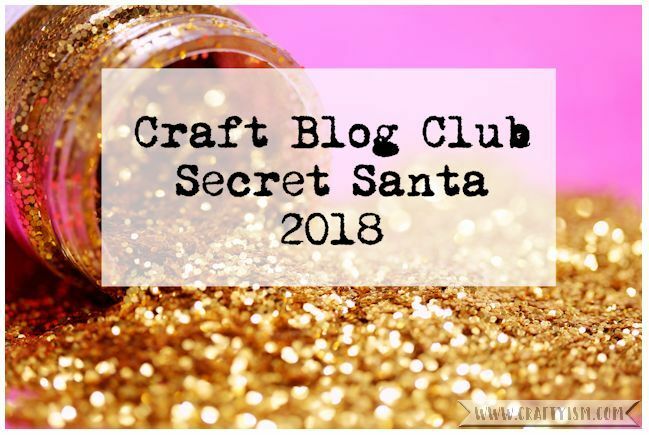 This was my second time taking part in the annual #CraftBlogClub Secret Santa. Everyone who wanted to take part was randomly matched with a fellow CraftBlogClub-er. Last year I was matched with Shelley of ShelleyMakes. This year I was matched with …. Shelley! So strange, but totally random! After sending Shelley a crochet project last year, I wanted to do something different this year. I decided on a wooden garland Christmas decoration. Of course like any good craft project, it didn’t go to plan! But after a couple of coats of paint, coloured pens and puffy paint, I ended up with this ‘Merry Christmas’ garland. I was pleased with the pom-pom holly berry and the tiny bells attached with holographic thread. I also added in a pack of Christmas tree seeds and a card to say ‘hello’ and Merry Christmas! I feel so lucky to have received such a lovely gift! I can’t believe how much thought and effort went into selecting and making gifts that I absolutely love. Thank you so much Rebecca ♥ I can’t wait now for #CraftBlogClub Secret Santa 2019! If you’re a crafty crafter or have a crafty blog, why not take part in the @CraftBlogClub twitter chats? You can have a look at their Website or Facebook page, or head over to Twitter on a Tuesday at 8pm GMT and search for #CraftBlogClub. Hopefully we’ll chat soon! Thank you! I love the video you made of your present, such a great way to show it off! Lovely post. Such a fabulous garland too.